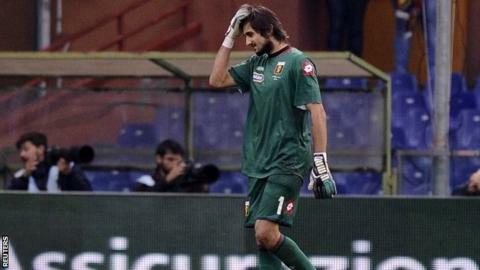 Roma moved to within one point of Serie A leaders Juventus with a victory over 10-man Genoa. The hosts went down to 10 men in the 29th minute when goalkeeper Mattia Perin was sent off for fouling Radja Nainggolan in the box. Adem Ljajic took the penalty but it was saved with substitute keeper Eugenio Lamanna's first touch. However, nine minutes later Nainggolan scored the only goal with an acrobatic volley from a Maicon cross. Roma wasted chances to increase the lead through Ljajic and Miralem Pjanic, and nearly paid for their profligacy when Genoa's Tomas Rincon headed the ball into the roof of the net in the last minute of injury time, only for officials to rule it out for off-side. The result means Roma take advantage of Juventus's 1-1 draw with Sampdoria to close the gap at the top of Serie A.
Genoa dropped down to fifth, below city rivals Sampdoria on goal difference. Match ends, Genoa 0, Roma 1. Second Half ends, Genoa 0, Roma 1. Diego Perotti (Genoa) wins a free kick in the defensive half. Offside, Genoa. Nicolas Burdisso tries a through ball, but Tomás Rincón is caught offside. Attempt missed. Nicolas Burdisso (Genoa) header from the centre of the box is close, but misses to the left. Assisted by Diego Perotti with a cross following a corner. Corner, Genoa. Conceded by José Holebas. Attempt missed. Mauricio Pinilla (Genoa) right footed shot from outside the box is too high following a set piece situation. Stefano Sturaro (Genoa) wins a free kick in the defensive half. Edenilson (Genoa) wins a free kick in the defensive half. Attempt missed. Juan Iturbe (Roma) header from the centre of the box is too high. Assisted by Alessandro Florenzi with a cross. Attempt missed. Miralem Pjanic (Roma) right footed shot from outside the box is close, but misses to the right. Assisted by José Holebas. Diego Perotti (Genoa) is shown the yellow card. Hand ball by Diego Perotti (Genoa). Attempt missed. Nicolas Burdisso (Genoa) header from the centre of the box is too high. Assisted by Diego Perotti with a cross following a set piece situation. Andrea Bertolacci (Genoa) wins a free kick on the right wing. Mauricio Pinilla (Genoa) is shown the yellow card. Offside, Roma. Francesco Totti tries a through ball, but Gervinho is caught offside. Attempt missed. Mapou Yanga-Mbiwa (Roma) header from the centre of the box is too high. Assisted by Francesco Totti with a cross following a corner. Corner, Roma. Conceded by Facundo Roncaglia. Attempt blocked. Alessandro Florenzi (Roma) right footed shot from the centre of the box is blocked. Assisted by Gervinho. Substitution, Roma. Francesco Totti replaces Adem Ljajic. Attempt missed. Diego Perotti (Genoa) right footed shot from the centre of the box is too high. Assisted by Luca Antonelli with a cross. Corner, Genoa. Conceded by Maicon. Corner, Genoa. Conceded by Alessandro Florenzi. Mauricio Pinilla (Genoa) wins a free kick in the attacking half. Attempt missed. Gervinho (Roma) right footed shot from the left side of the box is close, but misses to the right. Assisted by Davide Astori following a set piece situation. Substitution, Genoa. Mauricio Pinilla replaces Sebastien De Maio. Delay in match José Holebas (Roma) because of an injury.